​If you’re looking for a stylish and practical toaster that is capable of producing amazing toast then the Dualit Classic 2-Slice Toaster is definitely going to be high on your list. While the jury may be out on whether or not it is the best 2 slice toaster – both the toaster and the brand behind it certainly have sterling reputations and are renowned for their ability to evenly toast bread to perfection. ​Why Choose the Dualit Classic 2-Slice Toaster? ​As you would expect from a Dualit toaster, its quality is obvious from first glance. Unlike the regular Dualit 2-Slice Toaster, this classic model comes in a variety of different colors – ranging from brass, copper, and silver to brighter colors such as azure blue, lime green, citrus yellow, and even chili pink. With so many different choices, there’s bound to be something that suits your taste and would fit well in your kitchen. ​Surface appearances aside however, the Dualit Classic 2-Slice Toaster has built its reputation on the award-winning ProHeat elements that it utilizes. Not only do these elements have superior longevity and efficiency, but they’re also able to ensure that your toast is browned evenly. 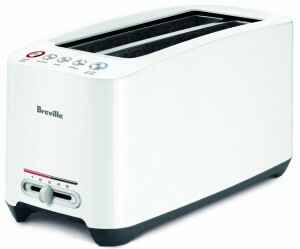 In contrast to most toasters nowadays, this classic 2-slice toaster only uses manual controls to set whether it is toasting one slice or two, and to time the duration. ​Even the ejector isn’t automatic however, and once the timer is done you will have to manually eject your toast. As strange as this may seem if you’re used to automatic ejectors, it is intentionally designed in this fashion so that the toast remains warm until you’re ready to extract it. Additionally, the manual ejector will allow you to check on your toast quickly and conveniently without switching off the heat. It is safe to say that the Dualit Classic 2-Slice Toaster is certainly a stylish and practical toaster. With its retro-style good looks and numerous color options it definitely has its fair share of appeal, and looking past all that it has very few equals when it comes to producing the perfect slice of toast. Granted it is expensive for a toaster, but it is worth emphasizing that this is much more than ‘just a toaster’ – it is a ‘Dualit’, and that name speaks for itself in terms of the quality of the toaster and the quality of the toast that you can expect from it.